Eleven Hope College student-athletes and two Hope teams shared top honors at the fourth-annual HOPEYs awards ceremony Monday night. 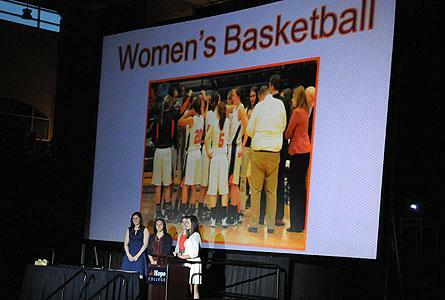 The program at DeVos Fieldhouse recognized the best performances for Hope Athletics during 2013-14. Hope College senior swimmer Bethany Schmall became the fourth recipient of the Karen Page Courage Award on Monday, April 14, during the HOPEYs program at DeVos Fieldhouse. Eva Dean Folkert’s dedication and care for Hope College Athletics were saluted during the HOPEYs award program at DeVos Fieldhouse on April 14, 2014.